Continuous improvement is an important topic at Kiremko. As a market leader in the potato processing industry Kiremko has taken the first step towards the future, in which innovation, smart industry and the success of the customer will prevail. Purchasing of a new ERP platform (Enterprise Resource Planning) is an important investment. Kiremko chose SAP S/4HANA. This platform will be implemented in 2019. Together with the company Delaware and the choice of SAP, Kiremko completed an extensive research phase. SAP S/4HANA is a platform that is already widely used in the food industry. The combination is directly made with the SAP C/4HANA CRM, a platform for customer relationship management. Marcel van Huissteden said: "We stand on the eve of data-management applications, where SAP can support us with optimizing and supporting our internal processes. Our goal is to shorten lead times by managing, analyzing and sharing data more effectively enabling us to facilitate our customers’ requirements successfully. " 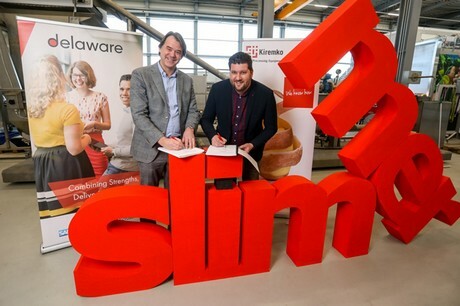 Jan-Bernard Blaas of Delaware and Marcel van Huissteden of Kiremko B.V. signing the contract on 21st January 2019 for the implementation of SAP S/4HANA en SAP C/4HANA at Kiremko in Montfoort. The total implementation process will cover ten to twelve months. With the advent of this platform Kiremko is in an excellent position to proceed with its innovations, data and information exchange in the potato processing industry. An internationally recognized software system is extremely important. SAP S/4HANA helps Kiremko to provide its clients with a smarter, more efficient way with order and manufacturing information throughout the process, from sales to project management and from design to delivery. Kiremko is a market leader of manufacturing machinery for the potato processing industry. We deliver total solutions that add value for each customer. We focus on product development, continuous improvement, innovative and sustainable technology and cooperation.